Loft bathrooms and showers are becoming increasingly desirable and for good reason: they add extra convenience, style and value to any home. The only problem is that standard shower enclosures don’t fit the unusual and restricted spaces like attics with slanted roofs and low ceilings. That’s why homeowners are increasingly turning to Showerpower, the UK’s leading specialist frameless shower company, for their bespoke loft bathroom expertise. Showerpower’s bespoke glass service overcomes the challenges of unusual and irregular spaces in lofts and rooms with an angled or pitched ceiling. This is because Showerpower’s glass technicians can precisely cut and contour the glass to follow the line of the ceiling and fit any angle. YOuYou You could have an extra bedroom with an en-suite, or even transform the whole of your attic space into a luxurious spa bathroom. 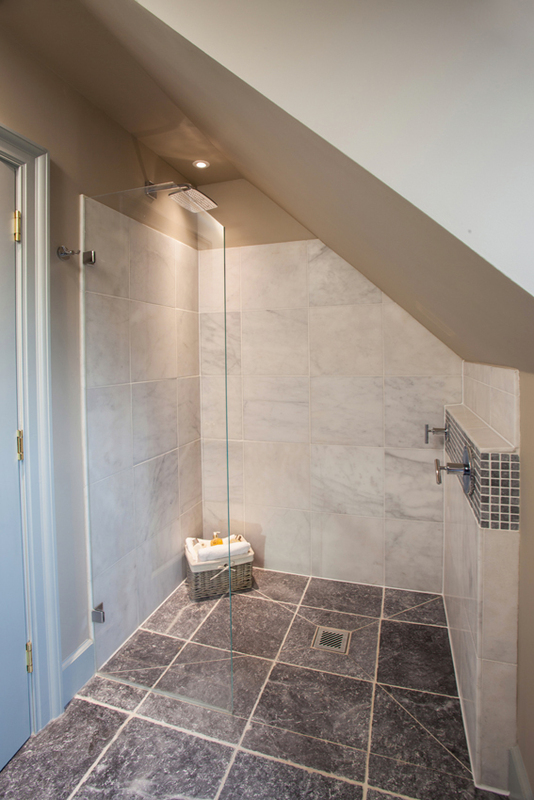 Check out our 7 top reasons to add a shower enclosure to your loft conversion. Showerpower will custom-make a beautiful frameless glass shower enclosure to meet your precise requirements, whether you want a beautiful curved floor to ceiling glass enclosure or an elegant en-suite in an angled loft space. Whatever the size or shape of the shower area, Showerpower can produce made to measure glass panels and doors of any height, width or slant – even curved. The end result will be a stunning shower that maximises the space in your loft conversion and is individually designed to suit your style and the room. A challenging situation needn’t stop you having the bespoke, frameless shower you want. At Showerpower we specialise in creating stunning bath, shower, wet room and spa enclosures even where there are uneven walls, restricted spaces or in heritage properties. We are based in Sussex and work in Surrey, the home counties and throughout Greater London and would be delighted to advise you on installing a bespoke frameless glass shower enclosure, bath, wet room or spa enclosure in your loft conversion. Please contact us online or call 01403 829020.